Do you find yourself working in multiple programming languages? Most languages use the same concepts – variables, loops, if/else, etc. But they use different syntax to implement them -- and it can be confusing trying to keep the differences straight in your head. Coder’s Stone for iPad™ lets you pick two languages and compare them side by side. Know how to use a Select statement in VB.NET but need to know what the equivalent code in C# looks like? 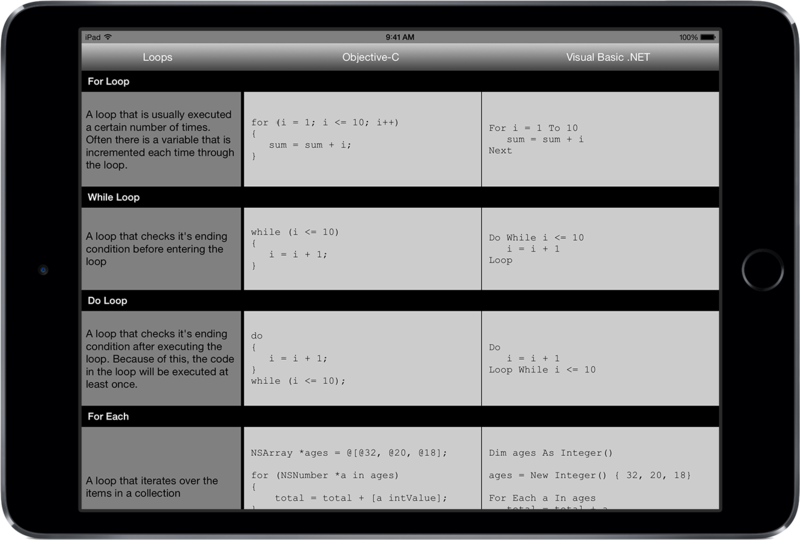 Need to know how to do a for each loop in Objective-C or Java? Coder’s Stone can show you these. And much more.